Give your indoor or outdoor space distinct ambiance with this Italian style indoor or outdoor floor fountain. 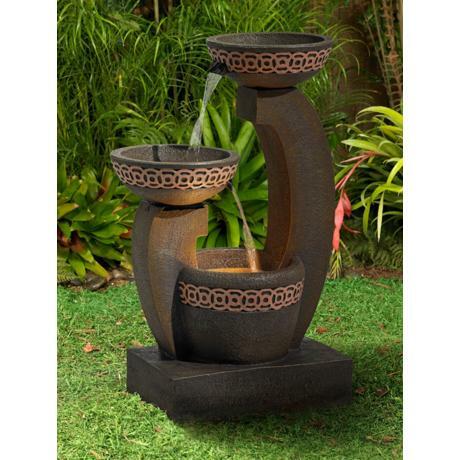 The Veneto standing floor fountain is named for it's rich Italian style. 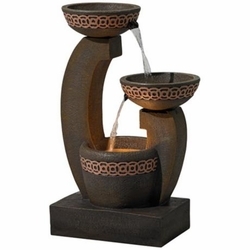 The tiered design features two basins atop curved arms with spouts that send water from one basin to the next for a handsome waterfall effect. Geometric lattice circle design is a classic element that offers timeless style. • Comes with water pump. • Includes a 5 watt halogen bulb.